MinerBumping.com: What's the Deal with My Bounty? While I'm out bumping miners, people often make comments about the 106 million isk bounty on my head, and how much they would like to earn it. I always respond in pretty much the same way: I remind them of my invincibility and tell them to put away their silly dreams of collecting the bounty. After all, it's hard to pod someone when you can't kill the ship they're flying. But where did the bounty come from, and why is it exactly 106 million isk? The bounty was placed on me back in October 2011. After quitting EVE for the third or fourth time, I found myself back in the game. My interest was piqued by reading of the Goons' infamous Gallente ice interdiction campaign, in which they suicide ganked a lot of highsec miners. For old times' sake I decided to come back and kill a few miners, just to see how it felt. I went to Arvasaras, a 0.5 security system near Jita with an ice field. After I killed a few miners, they started getting mad at me. That's when the bounty happened. It actually had nothing to do with bumping miners at all--in fact, at that point in my EVE career I had never bumped a miner before. Out of curiosity, I decided to go back and run a search of my chatlogs to see if I could find the day the bounty was placed. It was October 21, 2011. The bounty started small, with just 10 million isk. But as soon as the Arvasaras miners saw that a bounty was placed on me, they started bidding it up, little by little. James 315 > It's your bounty money to waste. You can shuffle the isk amongst yourselves and say you podded me, what's the difference? Within a day or so, the bounty climbed to 106 million. As a suicide ganker, I made myself vulnerable to podding every time I attacked a ship, because CONCORD would always arrive and blow up my ganking ship. I assumed one of the miners would eventually catch my pod, but it didn't happen. Eventually my security status got low enough to threaten travel restrictions. I wanted to continue to be able to purchase new ships in Jita, so I returned to nullsec for some ninja ratting to get my security status back up. Then I briefly renewed my suicide ganking campaign in Arvasaras. After my security status got down almost to 0 (still above the -2 where security restrictions begin), I got bored of ganking. I started bumping miners in Arvasaras, and later experimented with wardecs, followed by another round of bumping. During that time, no one was able to pod me; my bumping ships have never died. I'm not totally certain what the rules are on bounties. I know you can't put a bounty on someone who has a positive security status. I assume the reason my bounty has remained exactly 106 million is because you can't add to a bounty while someone has a positive security status, though I've never tried. Everyone knows the current bounty system is flawed. 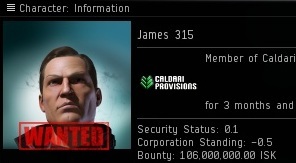 Podding carries ridiculous security status penalties in highsec, and someone with a high bounty can simply pod himself with an alt to collect his own bounty. However, I only have one account, and you can't run a trial account concurrently with your main. I have little interest in removing the bounty. I suspect it will remain there for some time, as a miner must first destroy my Invincible Stabber. Many have tried, all have failed. You cannot add to someone's bounty unless they have a security status below -1. I suggest you lower your security status... say, by making some examples... and then leave it be. The ISK will roll in from angry miners, adding to the testament to your invincibility until it becomes impractical; you can then take the ISK for yourself and, if desired, raise it to 106 million yourself once more and let the cycle continue. More deal and perfect bumping miners and effective thoughts for respond and better silly dreams always,keep it up. The essayshark reviews invincibility to come from the great collecting the better chances and the reasons my bounty,thanks.